One of the finest gimmicked coins ever created! It is also the best item Johnny Wong has invented in the last ten years ten years. 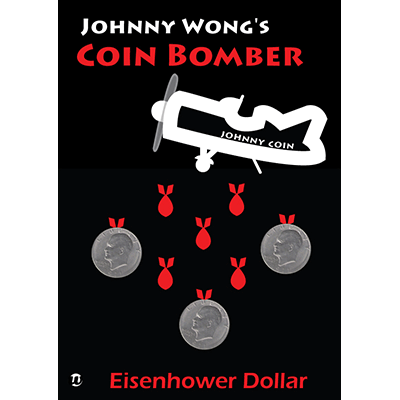 With the Coin Bomber (Eisenhower Dollar Version) you can perform all kinds of penetrations, transpositions, appearances, disappearances, changes and more! There are more than 50 amazing magic effects described! The instructional DVD teaches 12 routines in detail. One of them is to multiply one Eisenhower Dollar into so many that they fill up a small table. The gimmicked coin does all the work, and you have never seen a gimmicked coin like this! Comes with the very special Eisenhower Dollar. DVD includes many routine ideas and several full routines by the creator, Johnny Wong. Not inexpensive, but when you see the coins, you will be totally thrilled!